The Trustees shall discharge all their executive duties through an officer who shall be styled “President of the University.” He shall be appointed by resolution of the Trustees at any meeting of the Trustees to hold office at the pleasure of the Trustees… Resolved: That Thomas S Gates be, and hereby is, elected President of the University. Gates was an extremely well-respected Penn alumnus and Philadelphian who had already served as a Trustee of the University for almost ten years. He also worked closely with Josiah Penniman as the Chairman of the University of Pennsylvania Fund. The University certainly needed Gates’ knowledge and dedication throughout the 1930s and the first half of the 1940s, as the nation experienced some of the toughest times in its history. The 1929 stock market crash and subsequent economic depression of the 1930s significantly affected the University’s enrollment and endowment; and even before 7 December 1941 World War II changed the face of academia in the United States by turning her schools into training camps for all the branches of the armed forces. The Gates administration dealt with adversity remarkably well as it was never willing to accept defeat. Gates developed educational programs and expanded the physical plant of the University throughout the duration of his term. 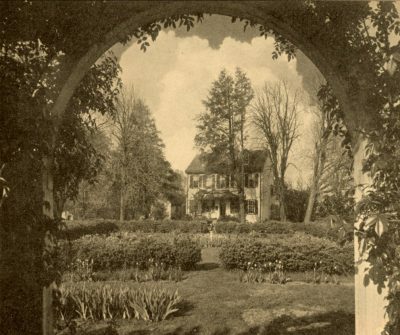 Penn’s alumni magazine, The Pennsylvania Gazette, described the new Women’s College in its 15 April 1933 issue. “A Woman’s College” discussed the history of women’s education at Penn, revealing that plans for creating a separate school for female students first surfaced in 1882. The article also explained that the establishment of a Woman’s College was imminent in 1933 due to increasing female enrollment and the reorganization of the University’s School of Education. While the new Woman’s College segregated women students, it also awarded them more individualized attention, academically. Women also enjoyed a significant development in educational opportunity at the very end of the Gates administration. The Committee on Policy and Planning established the School of Nursing in June 1944. The new school expanded the existing University Hospital-affiliated program by adding two years of preliminary college work; at the end of four years each student would be awarded a Bachelor of Science in Nursing. In “Establishment of a School of Nursing,” the Committee on Policy and Planning clarified the plans for the new program. In this report the Committee described: course of instruction, admission of students, fees, the necessary quota of women undergraduates, increased residential facilities, the degree, the inauguration of the plan, and continuation of the present hospital program. Like the Women’s College, the new School of Nursing gave women the chance to explore a variety of subjects while they received vocational training. A great university which has the duty of preserving and passing on knowledge of the past, -must also especially in a period of rapid social change such as the present, -keep abreast of the currents of the times and contribute its full share to the important tasks before us. The School of Social Work provided both public and educational services. The Gates administration continued its social service efforts when it moved to create an Institute of State and Local Government in 1937. Gates announced a conference of teachers and investigators in the field of political science for the formation of the Fels Institute of the Wharton School in March 1937. To use the development of the supplementary campus for the benefit of the entire University both educationally and socially. The Trustees emphasized the experimental nature of the Valley Forge education, but also expressed excitement for the curriculum they planned at the site, as it focused on “enlightened American citizenship.” The Trustees also believed that the smaller, more secluded environment would facilitate discussion and interaction among students and faculty members. This kind of interaction and study did not come cheap, however; a $585,000 price tag was put on the Valley Forge experiment. In spite of the expense the University’s Alumni strongly advocated for the Valley Forge plan. Throughout the 1930s the Gazette advertised the plan and called for support from all its readers. 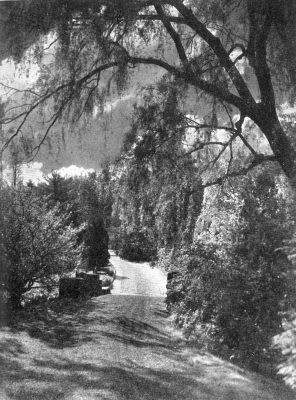 “Toward Valley Forge” appeared in the 1 July 1937 issue of the magazine. In addition to printing large photographs of the exquisite property, the article explained that moving a small number of Penn’s programs to Valley Forge would alleviate modern educational problems such as the impending “mass production” of education at universities resulting from increased enrollment. The article reiterated the Valley Forge Plan’s two major objectives and the cost of the program. “Toward Valley Forge” also articulated a number of benefits of the program including: cultural significance, close touch with the Philadelphia campus, individualized instruction, and new social and academic opportunities. The Gates administration ultimately had to put the Valley Forge Plan on hold due to the War; however it received renewed consideration during the McClelland and Stassen administrations. While the University ultimately decided to expand the Philadelphia campus rather than construct a new campus at Valley Forge, the plan enjoyed a great deal of popular support throughout the Gates era. With its wealth of trees, open stretches of lawn and meadow, plantings of non-shrubby character, winding brooks, grotto-greenhouses and excellent examples of ceramic art and statuary, the arboretum offers a variety of attractions, both to the layman and the scientist. The historic public garden is still in operation to this day. The Gates administration decided on a $12.5 million goal for the campaign. The Gazette publicized the fundraising drive on 1 July 1936 in “The Bicentennial Campaign.” This article restated the general needs of the University, particularly focusing on the importance of improving teaching at the University and on the Valley Forge Plan. The Gazette‘s efforts to publicize the campaign proved rather significant because the magazine reached many of the University’s alumni. 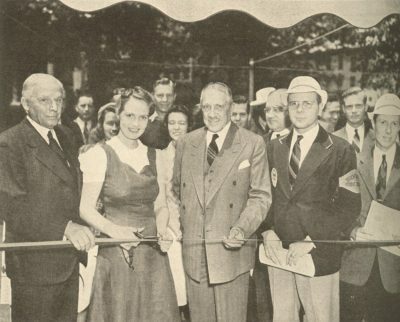 The way in which the administration connected the Fund to the 200th anniversary celebration of the University was another important publicity agent. Still, the Bicentennial Fund failed to reach even half of its proposed goal; by its close following the conclusion of the Bicentennial Celebration in September 1940 the Fund had only managed to raise $5 million. While Gates’ fundraising efforts fell short, he proved his incredible expertise and administrative ability by guiding the University through one of the most serious events in the history of the nation and world. While the United States did not officially declare war on the Axis Powers until December 1941, many, including Gates, understood the inevitability of the nation’s involvement in World War II. In fact, he appointed a University Committee on National Defense as early as October 1940. 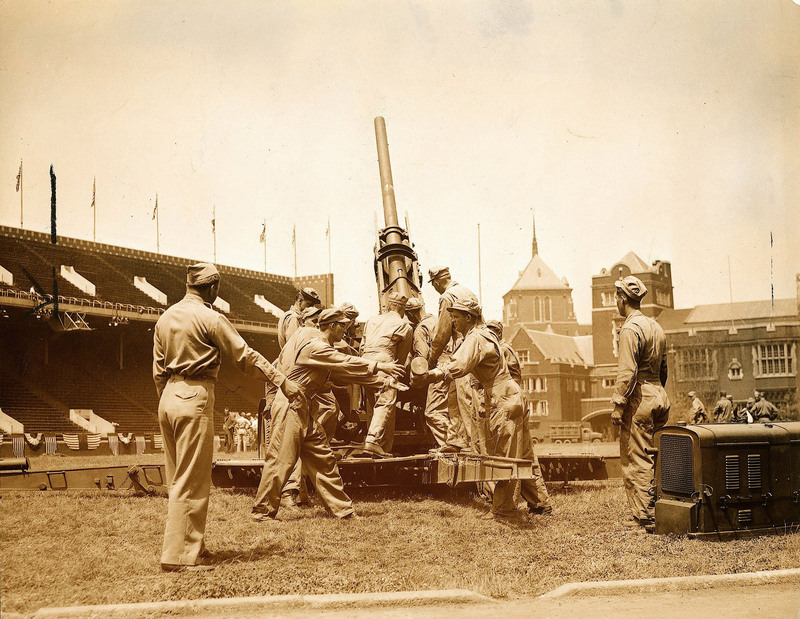 Shortly afterwards, in December 1940, the Engineering School initiated a defense training program. 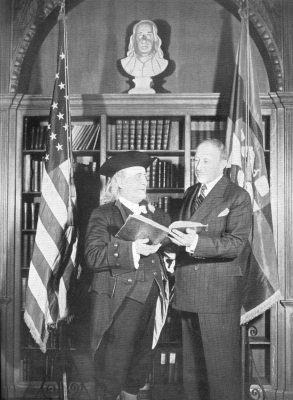 After the United States declared war in December 1941 the University stepped up its efforts, particularly after Provost McClelland attended the meeting of the Association of American Colleges on 3-4 January 1942. In the Minutes of the Trustees for 9 January 1942 a Committee on Acceleration recommended that a number of summer programs for accelerating the completion of degrees in Engineering, Law, and Medicine be implemented. At this same meeting Vice President Musser informed the Trustees that the Army had suggested that students in the service be given correspondence courses and that they also receive rehabilitation services after the war. 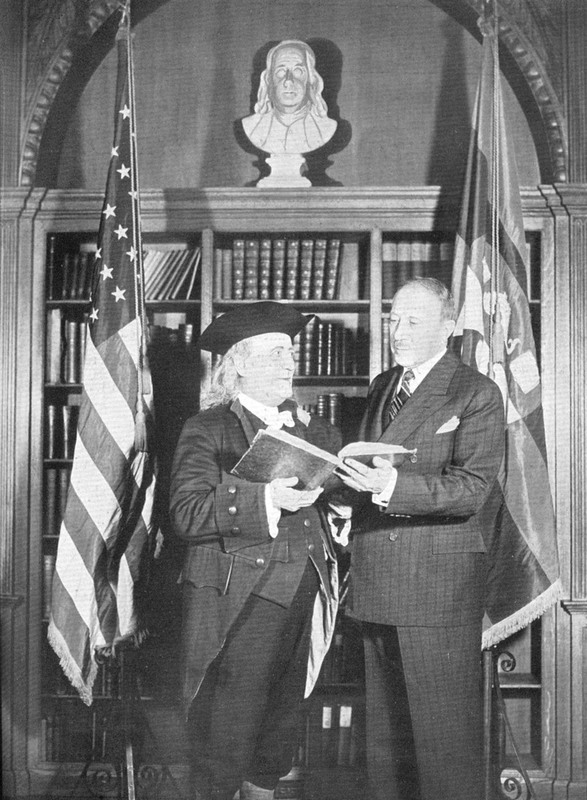 By the beginning of 1943 the University was training young men in the United States Naval Flight Preparatory School and Navy College Training Program, in addition to offering its own Medical Officer’s Training Program. The University also housed an Army Specialized Training Program. The University worked diligently throughout the duration of the war. The Gazette reported on the University’s contributions to the war effort monthly. 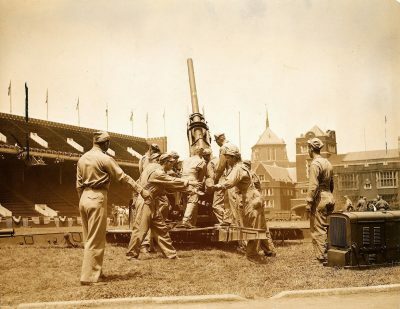 In January 1944 the National Council on Education reported that the University of Pennsylvania, with over 2,700 service men in training, ranked fourth in the number of trainees receiving instruction, nationally; when the men involved in the Naval Preflight School were included Penn ranked first. Thomas Sovereign Gates’ devotion to the University of Pennsylvania allowed him to persevere through the toughest of times. Considering his limitations, Gates was remarkably proactive as President of the University. 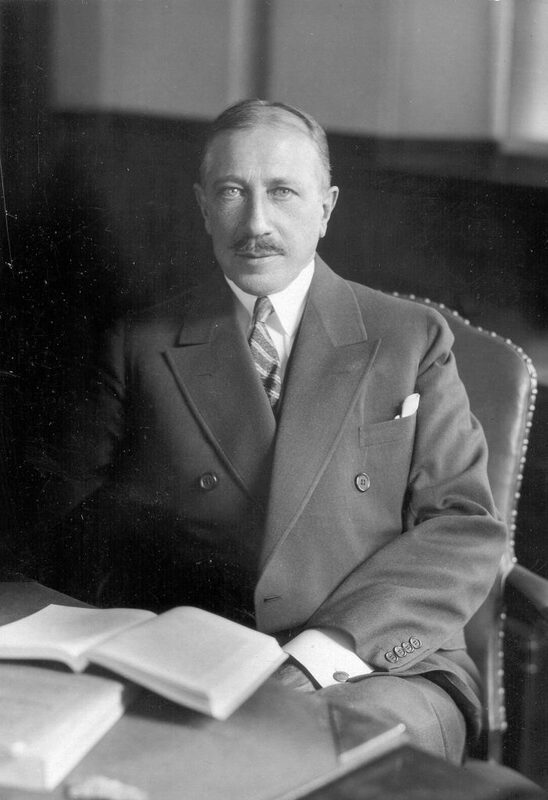 His close relationship to the Board of Trustees allowed him to create effective and innovative plans that allowed the University to make significant strides during the 1930s and early 1940s.